This article would like to present brief information about how does mouth cancer start. 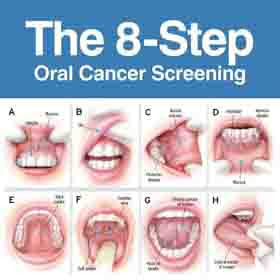 In essence, timely treatment and early detection are needed, so that one could avoid the death from oral cancer. Statistics said that when the disease is treated in timely manner, one could reduce the risk of death from mouth cancer. A person with a localized mouth cancer has a survival rate of 83 percent, which is bigger than those who have mouth cancer which has spread to other organs (about 32 percent of survival rate, according to statistics). It is said that early detection of mouth cancer is possible, for the signal of beginning of mouth cancer can be felt and seen easily. 1) A diet low in vegetables and fruits often play a role in appearance of mouth cancer. 2) Mouth cancer will be appeared if body is too often receives sun exposure. 3) 40 years old people have greater risk of having mouth cancer. 4) A subset of mouth cancers also linked with transmitted Human Papillomavirus (HPV 16 type). 5) Mouth cancer is also linked to heavy alcohol use and cigarette smoking, or the both. By all means, people who are too often consumed alcohol and smoked together having greater risk. In relation with such a question as how does mouth cancer start, there are signals that might show people the signs of mouth cancer, namely white lesions (leukoplakia) and red lesions (erythroplakia). If either red or white lesions don’t resolve after two weeks, then the condition should be considered and reevaluated for biopsy. Doing that so a person can get a definitive diagnosis. Furthermore, lesions with erythroplakic bring much higher potential for becoming mouth cancer. There are possible symptoms and signs of mouth cancer, including feeling or soreness that there is a thing caught in the area of throat, a thickening or lump in the mouth soft tissues, ear pain, difficulty in swallowing or chewing and moving the tongue or jaw, hoarseness,swelling of the jaw, and numbness of the mouth or tongue. If any of these problems persist for more than 2 weeks, someone must have a clinical examination along with laboratory tests So, if you ask how does mouth cancer start, you must learn all the possible signs and symptoms of mouth cancer.